Being another super-heavyweight, BBB shares several parts with series 3's Vader, except for his head, hands and upper torso. The head and torso are new in the line. I initially thought Bam Bam shared his torso with his wavemate Akeem, but after comparing them side-by-side, I noticed Akeem's is new, too, and much "fatter" than BBB. The torso perfectly captures the big man's bulk with his chest overlapping his abdomen and ribcage. The new pieces make Bigelow just a bit taller than Vader, which is actually incorrect since Bam Bam was billed as 6'3" and Vader at 6'5". I wouldn't call it a huge issue, I didn't even consider it until I looked up their sizes on Wikipedia and we at least continue to have some height variations in the line. The paintwork on Bam Bam's outfit is really nicely done and actually makes his entrance attire that much more of a disappointment, but more on that later. The flames across his ring attire is rendered in yellow, orange and red paint, alternating in such a way to make it look realistic. The application over the black base is sometimes weak, mainly were the yellow paint is directly over the black area, but it's really only noticeable up close. Bigelow's "triple B" logo is cleanly stamped across his belly in two tones without any blurring between the colors. BBB reuses Vader's short boots molded in black with white paint used on the soles and shoelaces. Bigelow's headsculpt is truly devious. He looks like he'd just as soon bite your face off and eat it as he would crush you with a moonsault on to the canvas. His beard is sculpted and then painted brown. The application is well done without any slop on his face. Bam Bam's head tattoo is adequately detailed and also applied cleanly. He also has several tattoos on his arms and while two of them are on his upper arms, covered by the sleeves on his suit, Mattel added just enough of each tat poking out below the edges of the sleeves. They could have easily just skipped those applications altogether, but it's nice to see they went for authenticity. Each of his forearms are adorned with eagle tattoos, but I suspect the one on his left forearm may be a griffith. Either way I'm still amazed how clearly they can apply these illustrations on seven inch figures. Inspite of Bigelow's size, he still retains the standard articulation for WWE Legends, however some points are more limited than others. His hips, for instance, barely reach 45 degrees forward and the fat around his neck restricts his head movement just a bit. Everything else works fine, but I did have trouble with his ankles (a seemingly recurring problem with Mattel's Legends and Elites). Much like Vader, he kept falling forward whenever I tried posing him. This issue isn't specific to the larger figures, I've run into the same problem with average-build figures, too. I recently purchased the Elite Sheamus and he had probably the worst case of loose ankles I've encountered. It seems that much like several of Mattel's Masters of the Universe Classics figures, the ankle peg is too long keeping the lower leg and foot from touching and thus not providing enough support to hold the figure upright. You can balance the figure, but it's only a matter of time before it takes a dive. To remedy this I used a couple of those clear rubberbands found in much of Mattel's packaging to wrap around the peg until it provided enough support to tighten up the ankle joint. Since the bands are clear and inside the joint, you won't notice them when you display your figures and you can always remove them later (with the help of an unwound paperclip). 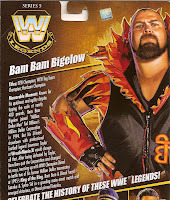 And finally we arrive at Bam Bam Bigelow's accessories all of which are part of his entrance attire. I don't remember this particular entrance attire and I was a bit too lazy to research it thoroughly online, although a quick search indicates he wore this in 1995. The attire consists of three pieces: the vest and two forearm guards. The guantlets close up around his forearms with the use of two pegs (even though it looks like there are four pegs) on the insides of his forearms. The vest features three pegs running down each side allowing the front and back to separate and remove over Bigelow's head. The vest is simultaneously awesome and disappointing, but I'll hit the high points first. The vest features lots of detail! It's beautifully sculpted with layers upon layers of flame all around the vest and up the collar. Even Bam Bam's logo and the flame field on the back are sculpted out on the vest. It's made of a very thick rubber and feels really sturdy and durable. The locking pegs on each side are wide and don't look like they'll break easily during normal use. The only real downside to the vest is the lack of detailed paint applications. It's molded in orange then painted with black for the base area behind the flames and silver for the lettering. And that's it. That's the extent of the paint apps. The worst part being Bigelow's picture on the card, showing all the red and yellow detailing missing on the vest. It's really a shame after the fantastic job they did sculpting it. Mattel similarly dropped the ball with Vader's mask. It had plenty of detail, but the paint wasn't there to make it 100% accurate. I took the liberty of adding black lines to Vader's red mask and planned to add the details to Bam Bam's coat, but I expect it to be time consuming and the fact that I shouldn't have to do it isn't motivating me to start anytime soon. I've read a lot of negative reactions to Bigelow's entrance attire, some fans stating it looks ridiculous or goofy. Well, I must point out that we are talking about PROFESSIONAL WRESTLING and absurdity is the name of the game. Personally, I like the entrance gear. It looks cool in action figure form, except for the lack of painted detail. For that fact alone, I will be displaying Bam Bam in his ring attire only (until I can detail the coat), which thankfully has enough detail on it to make it accurate. In all, I'm happy with the figure. 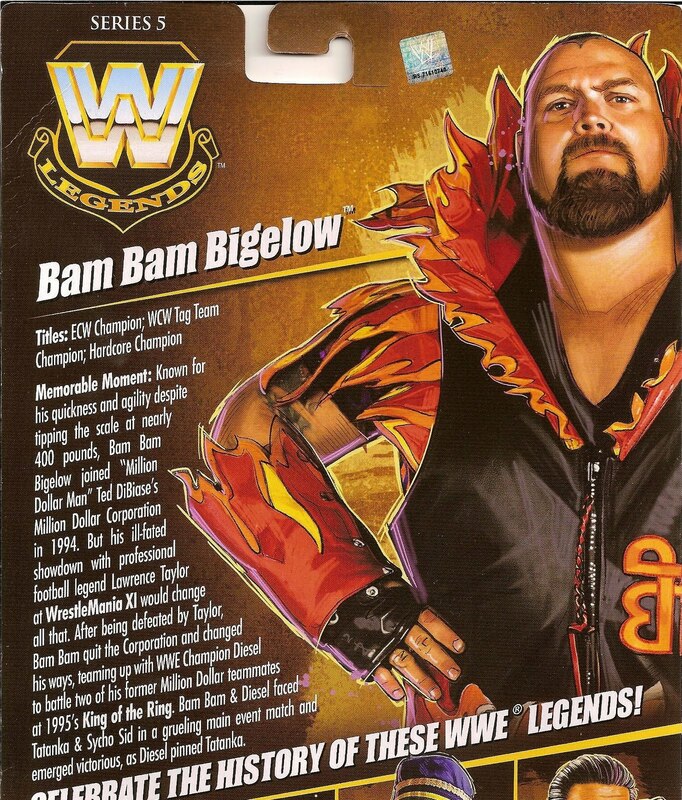 Bam Bam Bigelow is once again a great rendition of a classic Superstar and I'm sure collectors will enjoy him with or without the flame coat. I snagged BBB (along with Rick Martel) at Walmart for nearly seventeen bucks early last month, only to find him a couple of weeks later at Toys R Us, where WWE Legends are now selling for $12.99 and qualify for the McMahon Mail-away figure. Of course, next year you'll have to make all your Legends purchases from Matty Collector (bleh), so I recommend you hit your local TRUs and get your hands on as many Legends as you can before you have to shell out $15 (hopefully) plus at least $10.00 for shipping & handling and more than likely, taxes. Are these figures worth $15? Yeah, but they're a better deal at 13 dollars. Are they worth almost $30 for one figure? No, I can't say that they are.